Mavros, the Atlas flagship cable, is different from those we're used to, both physically and sonically. Mavros is a range, rather than a single product, that embraces speaker cable, single-ended interconnects and a balanced/XLR-based interconnect. All three of which were available for this test, though it's the single-ended interconnect and a 2 into 4 bi-wire speaker cable that we're concentrating on here. The interconnect uses a 'microporous' PTFE dielectric with an ultra-low dielectric constant of 1.5, which improves signal velocity (Nordost makes a similar claim for its cables and there is good reason to believe this is not the usual marketing hype), which is wrapped in a Mylar jacket, a cotton filler to reduce microphony, a close weave-shielding braid to reduce RFI, a PVC jacket and finally an outer woven cotton sheath. The cable itself is an OCC (Ohno-Continuous Casting) monocrystal cable which is said to have just one boundary in 700 feet of conductor, so that the audio should not have to transverse many grain boundaries. The 73-strand multi-diameter wire cable interconnect and 385-strand speaker cable is 99.999% (6N) free of oxygen and other impurities. Both are made the same way. 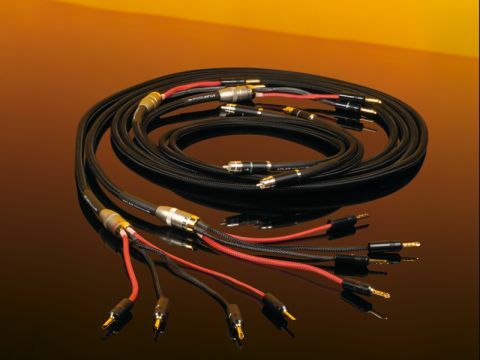 The interconnect is available terminated by XLR connectors in the balanced version in various lengths. These are completed with non-compressing, double-screened, self-cleaning plugs. Similar care is taken with the speaker plugs, with spades available as an option. One point that cannot escape notice is the physical integrity of the Mavros cables. The connectors are firmly located and show no inclination for the conducting pins to fracture (which happens with hollow pin plugs), or to work loose through handling. The balance of the Mavros cables doesn't have quite the transparency and speed of a Nordost Valhalla, but it gets close. This is still a fabulously clean, agile-sounding design in both interconnect and loudspeaker versions and it has the particular benefit of being unusually well balanced. LF voicing is expansive and powerful, and there is no tendency for transients and HF content to lead. Its fluid, grain-free presentation is certainly impressive, though in this area it was the interconnect that was the most accomplished. Atlas claims that Mavros speaker and interconnects work well in combination and this appears to be the case, not least thanks to the similar balance of the two. I also formed a distinct preference for the balanced interconnect in a system that make good use of such cables (which for this test included the Yamaha 2000 electronics and Denon's DCD/PMA-SA1), but true internal balanced operation is a long way from universal, even with equipment with balanced socketry. And if it is used with equipment that is single-ended internally, single-ended cables are likely to give the best outcome. Almost imperceptibly, Scottish cable manufacturer Atlas has been growing in status, thanks to some good technology, a straight-forward set of technical claims (which are refreshingly free – mostly free – of the gobbledygook that usually surrounds many brands), impressive build quality and, we'd guess, some well-informed listening.